Contact Luka to check avilability and rates. 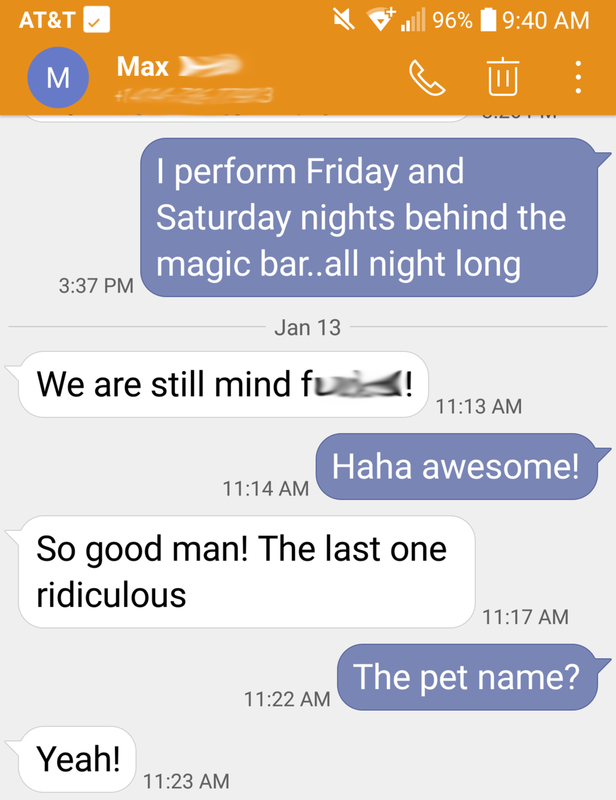 Jan 25 Days later, and his mind was still blown. When I perform I want the routines I present to my audience to have an impact on them long after I have finished. Recently an old friend who I had not seen in about 7 years, (he moved to AZ) surprised me by stopping in to watch me perform at The Safe House. Max and two of his friends hung out with me for a couple of hours as I performed a number of mini-shows for them and other people who came by. By the end of the night not only was his mind blown, but so were the minds of the friends he came with. This is a regular occurrence for me at the safe house. However, what let me know my material was actually having an impact on those who watch, was the random text message I received a few days later. Parts of the message are blurred out, but I think you will understand why. Now, Max is not just a random friend. Early on in my entertainment career he was my guinea pig. Max was one of the first people to see a new trick, and he has seen some pretty bad ones at that. In the past, Max may have known or at least had a pretty good idea on how I "did it". This time around he had no clue, and he was sure to let me know. I love it when people give me praise about my shows, but it means so much more to me when someone who has seen me grow as an entertainer says it. So to Max, Andrew, Ashley and everyone else who I am able to entertain I want to say thank you. Thank you for letting me share my craft with you, and I hope you have as much fun watching me, as I have performing for you.